I absolutely love arancini balls. There’s something deeply satisfying about the crispy outside, creamy rice filling and gooey cheesy centre! YUM! They’re super tasty, great for entertaining and best of all, easy on the purse strings. To make things really easy, I usually make a double batch of my super-easy-mid-week risotto (recipe here). Before adding the peas and roast pumpkin, I remove half of the risotto and place it in a bowl and pop it in the fridge. This then becomes the arancini balls the following night. 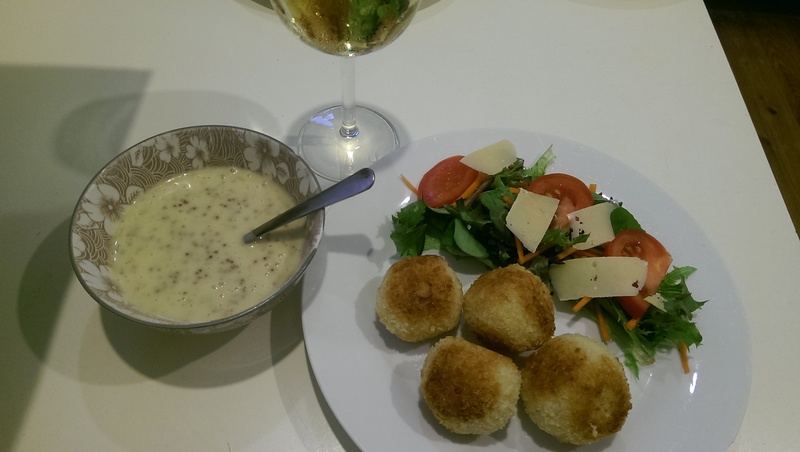 Arancini balls are extremely versatile. If you check out recipes on line, you’ll find dozens of variations. Some use a Bolognese or ragu in the centre, some use a mozzarella filling or even pancetta, spinach and ricotta. Go as fancy as you like. However, for a mid-week meal, I like to keep things really simple and so opt for a standard cheesy centre. And not even the fancy cheese. Standard cheddar. And it is still delicious. Arancini balls can be made into any size, but I usually find 1½ tablespoons per ball is a good size to encase the filling. The cold risotto can be a bit sticky so have a bowl of water handy to wet your hands to make rolling the balls easier. 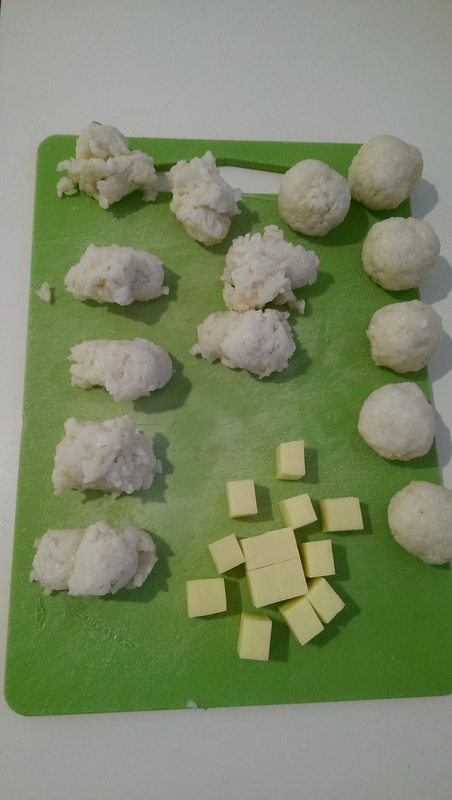 Grab your spoon of rice, add a 1cm cube of cheese to the centre and using wet hands, roll the rice around the cheese. Continue with the remaining rice. Roll the rice ball first in the flour to coat, then in the egg wash, then finally the dried breadcrumbs to completely coat the ball. 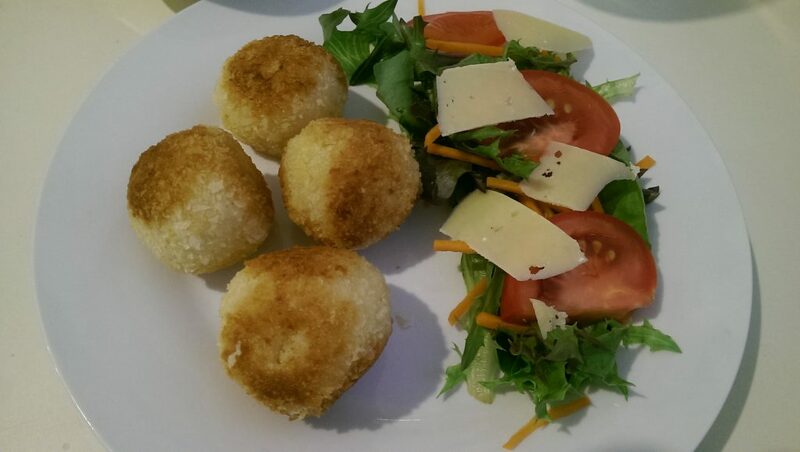 Continue with the remaining arancini. Once that’s done, you’re ready to cook! I find a shallow-fry in a large frying pan with a few millimetres of oil in the bottom is the easiest way to cook them. Cook them until they’re golden all over and heated through. 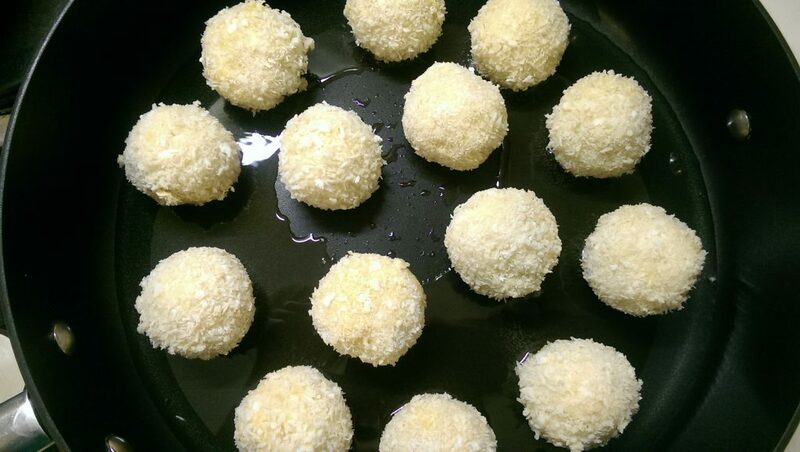 You may need to cook them in a couple of batches so keep them warm in a low oven (100ᵒC is fine) while you’re cooking the remaining arancini balls. I like to serve them with a simple salad, and any type of sauce or dressing you like. A homemade chilli jam works beautifully with them, or even a creamy mustard dressing as pictured here. So from leftovers, you’ve got something easy to make that’s utterly delicious. We absolutely love them, and hope you do too.